Keep Your Same Fax Machine – Our service works with all existing fax machines. Keep Your Same Fax Numbers – We’ll simply switch your existing fax telephone numbers over to our advanced network. TOTAL FAX from Cloud9Phone offers a unique solution that provides you with a number of advanced features at a price that is typically less than you’re paying for your traditional FAX line today. FAX from Outlook, Gmail, AOL, Yahoo, Etc. Stop throwing your hard earned money to companies like AT&T & Verizon for phone lines that are dedicated to FAX machines and move up to the most world’s most robust FAX solution available today with TOTAL FAX. Cloud9Phone’s Total Fax Adapter offers a unique solution that provides you with a number of advanced elements, at a price that is typically less than you are paying for your legacy FAX phone-line today. Total Fax Adapter works with your existing fax machine and allows you to receive Faxes even when your FAX machine is in use, incoming faxes will queue up and be sent to your fax machine when it becomes available. You can also have faxes sent to your email as a PDF attachment for no additional cost. When you switch over to Cloud9Phone’s Total Fax Internet Adapter, you can disconnect your old traditional fax line for an immediate savings, while adding so many great features. Connect any ordinary fax machine to Cloud9Phone using a dedicated Fax Adapter and continue using your existing fax machine and document workflow. As a hosted, managed cloud service, Cloud9Phone gives users peace of mind. Rest assured, your fax document management system is always available, and your data is secure, off-site and guarded against theft, loss and disaster. Access, manage and share all your fax documents and business data using Cloud9Phone’s platform-independent Advanced Web Client. Our state-of-the-art software delivers a user experience that rivals desktop software yet runs in any standard web browser. With Cloud9Phone, there are no software licenses to purchase or maintain. Enjoy dozens of standard productivity features and tools that are not available elsewhere. Superior reliability and ease of use lowers the learning curve and promotes rapid adoption. Connect any number and combination of fax machines, computers, scanners and multi-function printers to Cloud9Phone. Your Cloud9Phone service grows with your business and handles all your users, equipment and fax numbers. 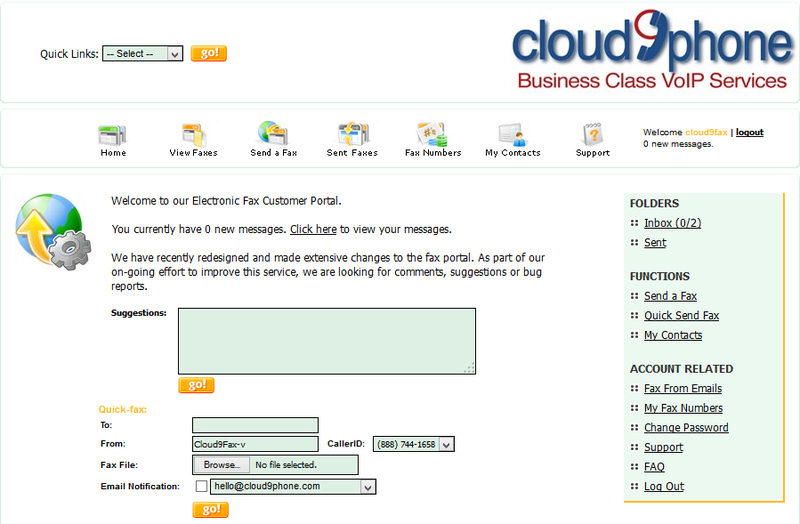 Cloud9Phone is one of the most cost-effective fax systems available today. Enjoy lower Total Cost of Ownership (TCO) and higher Return On Investment (ROI) than the competition. With Cloud9Phone, there is no expensive equipment to purchase and no software to license, manage and maintain. With minimum integration and setup costs, Cloud9Phone is a tremendous value to any organization. Cloud9Phone eliminates your IT burden with simple integration, a quick learning curve and maintenance-free equipment and software. Make Cloud9Phone an integral part of your disaster recovery plans. Using Cloud9Phone means never having to worry about the availability of your important business data.